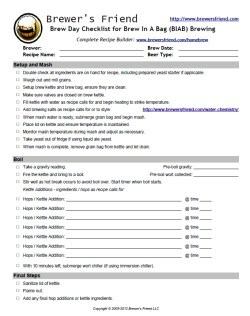 This checklist contains the steps for Brew in a Bag (BIAB) all grain brewing. The sheet is is tailored to the BIAB method, as opposed to our standard All Grain checklist. By using this sheet, you will remember things that are easy to forget, like adding brewing salts, or writing down pre-boil gravity. Enjoy! Print out the PDF document and keep the sheet handy when you are brewing. Read it over before you start. Refer to it during racking (option) and bottling / kegging. Designed for use with the All-Grain Brewday Recipe Template. See the following links for more information on BIAB: How to Brew using BIAB, Custom Made Bag and False Bottom for BIAB Brewing. P.S. Let us know if you think it needs any updates.